The Open Dome Top style features a stainless steel gasket rim around a 6" top opening for drop-in convenience. 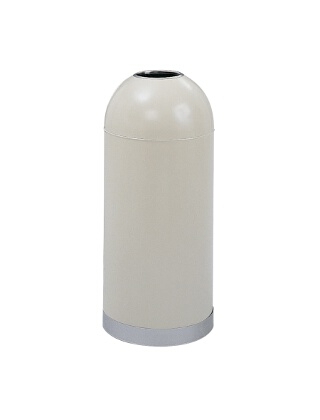 Ideal for hospitals, clinics, nursing homes or anywhere hands-off disposal is desirable. Manufactured from top quality fire-safe steel which will not burn, melt or emit toxic fumes, this unit meets OSHA requirements for waste receptacles. The wide stainless steel bottom edge is rolled under to protect floors. Galvanized steel liner is included. 15-gallon capacity. Powder coat finish in Black, Putty or White.